The Book of Kells facsimile no. 349, on display at UBC Library. The Ridington Room in the Music, Art and Architecture (MAA) Library at the Irving K. Barber Learning Centre has added a new permanent installation that will be of interest to anyone with a penchant for medieval illuminated manuscripts. The Book of Kells facsimile, which was acquired by UBC Library’s Rare Book & Special Collections in 1990, had previously been housed in UBC Library’s Vault, but now resides in a secure, purpose-built display case, accessible to the UBC community. The original Book of Kells, which is held on permanent display at Trinity College Library in Dublin, Ireland, is a 9th Century manuscript documenting the four Gospels of the New Testament in Latin. Named after the Abbey of Kells, where it was kept for centuries before moving to Trinity College, the manuscript is divided into four volumes. The Ridington Room in the Music, Art and Architecture Library at UBC. UBC Library’s facsimile of the Book of Kells was produced by Swiss publisher Faksimile-Verlag Luzern in 1979 using cutting edge technology of the time to photograph the original pages and produce a limited run of exact copies. UBC Library’s copy, no. 349, is accompanied by a presentation book from Vancouver’s Book of Kells Committee, which formed in 1987 in order to purchase the item through donor support. The original Book of Kells Committee consisted of 14 members who together raised $16,000 from 340 local donors. A plaque attached to the display case celebrates those who offered their support. 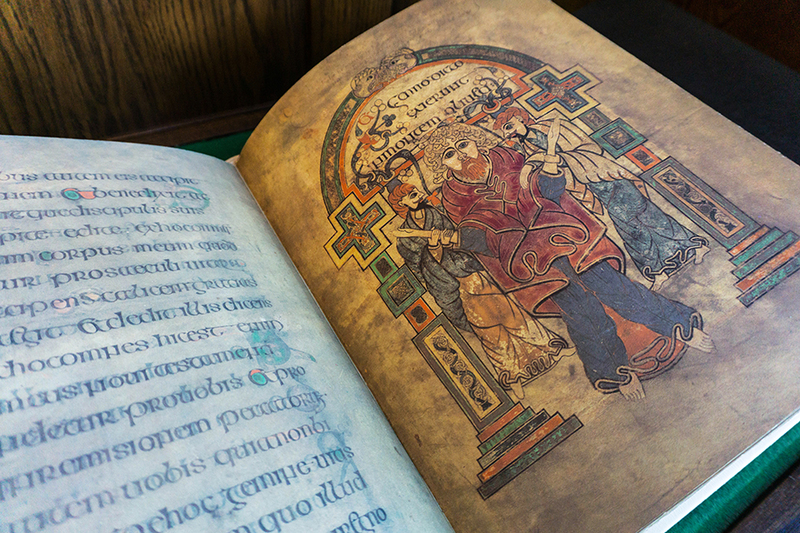 The Book of Kells is available to view during the MAA Library’s regular hours of operation. Check the website to find out more. 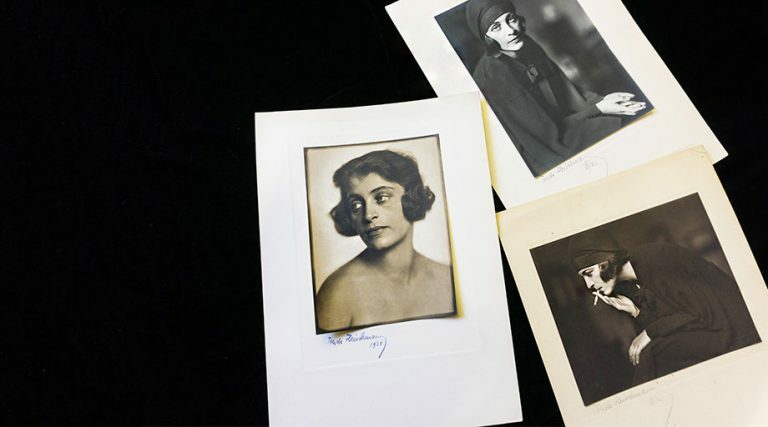 UBC Library’s Rare Books & Special Collections (RBSC) has acquired the personal archive of Hanne Wassermann Walker (1893-1985), a significant figure of pre-WWII Viennese cultural and social life. Her remarkable story has been relatively unknown until now. Born in Vienna to a Jewish family, Hanne Wassermann Walker left Nazi-occupied Austria in 1938. After living briefly in England, and then in New York, she went on to emigrate to Canada, taking up residence in Vancouver and later North Vancouver with her second husband, George Dickson Walker. She became a resident of British Columbia in 1943. A well-known figure of Viennese society during the 1920s and 1930s, Wassermann Walker was at the forefront of the Weimar-era body culture movement. Her school of gymnastics and health manuals for women brought her international fame and recognition from reputed medical institutions and clinical specialists. Among her correspondents, friends and students were film stars, artists and members of the European aristocracy, including the Rothschild family, Lady Louis Mountbatten, Helen of Greece and Denmark and actress and wireless communications pioneer Hedy Lamarr. In 1985, Hanne died without heirs, and items from her estate were acquired by a local collector. In the Fall of 2018, Katherine Kalsbeek, Head of Rare Books and Special Collections, and Krisztina Laszlo, RBSC Archivist were offered first refusal on the archive by a local bookseller. 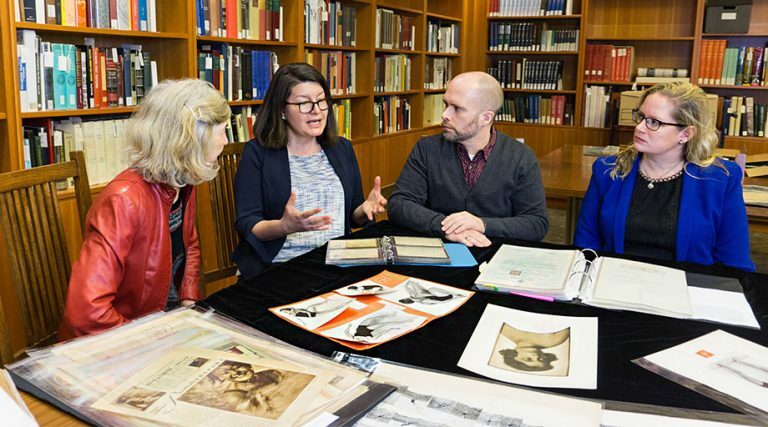 With the support of faculty from many UBC departments, Kalsbeek and Laszlo worked to identify the funds required to ensure that the archive would stay in British Columbia. “The response from both UBC and the larger community has been exceptional,” says Kalsbeek, “From numerous individual donors, to foundations, to key departments here at the university, there has been overwhelming support for our effort to ensure that Hanne’s archive stays in British Columbia.” The library saw generous support from the Azrieli Foundation, Reesa Greenberg and the Clematis Foundation, Lorne Greenberg and the Lorne Greenberg Family Partnership, Anthony von Mandl of Mission Hill Family Estate winery, the UBC President’s Office, the Faculty of Arts, the School of Kinesiology, and the Department of Central, Eastern and Northern European Studies (CENES). Hanne Wassermann Walker as photographed by Trude Fleischmann. 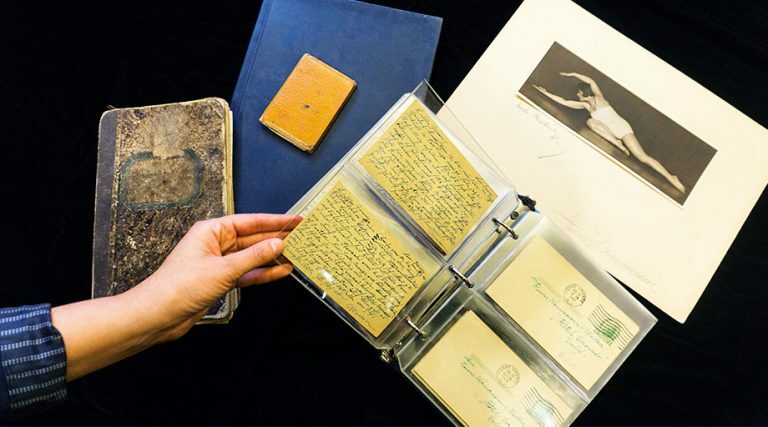 The archive itself is extensive, including an impressive number of documents, correspondence, print media coverage, photographs and artifacts that span over a century. One of the highlights is the collection of documents and photographs tracing Wassermann Walker’s life-long friendship with Trude Fleischmann, ranked among the most significant portrait-photographers of the 20th century. Not unlike Wassermann herself, Fleischmann was forced to leave Vienna during the war, to relaunch her career on the North American continent. The archive contains hundreds of photographs taken by Fleischmann during the height of Wassermann Walker’s successful career in Vienna. A large part of the archive documents Wasserman Walker’s struggle to obtain compensation for the loss of her family’s property seized by the Nazis. The archive contains letters from lawyer Gustav Rinesch, informing Hanne of the details of her parent’s estate and his work on her and her sister’s behalf with the government of Austria. Personal correspondence from the archive. Patricia Vertinsky, Ilinca Iuraşcu, Kyle Frackman and Katherine Kalsbeek pore over the archive. Perhaps most heartening is that the Library’s acquisition of the full archive prevents the archive from being broken up, divided and sold, which would have meant that the fulsome picture it presents of Wassermann Walker’s life and work would be lost forever. Learn more about the Library’s Rare Books and Special Collections. UBC Library has now completed its Harry Potter collection of original first editions with the recent acquisition of a U.K. first edition, first printing of Harry Potter and the Philosopher’s Stone. The library’s Rare Books and Special Collections department has been building a collection of first edition Harry Potter books since spring 2015 as part of the Arkley Collection of Early Historical Children’s Literature, which is focused on popular works. “As the most popular children’s literature series in several generations, with global impact equaling Alice’s Adventures in Wonderland, Harry Potter is an important series in the children’s literature canon,” says Chelsea Shriver, UBC Rare Books and Special Collections Librarian. 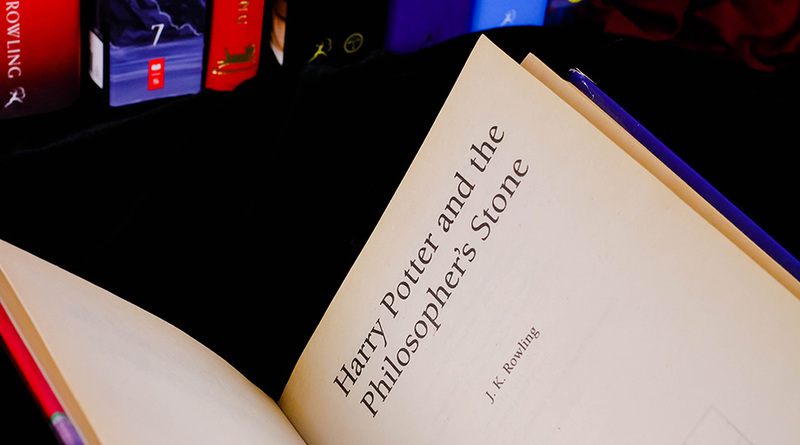 Although the first Harry Potter book was published just over 20 years ago, the U.K. first edition, first printing is rare and difficult to obtain. The original print run was only 500 copies, 300 of which went directly into libraries and were never intended for sale. The latest book in the collection was purchased with money from a number of library collections funds including endowments and donations from a 2017 crowdfunding campaign. 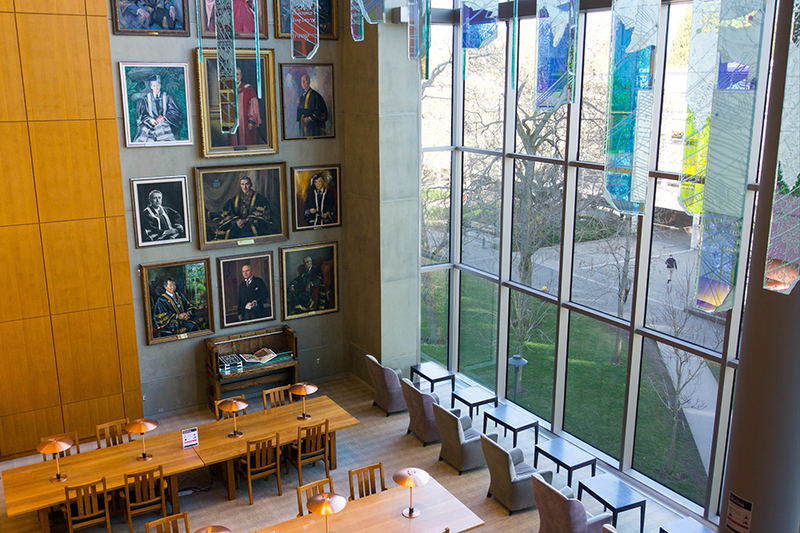 UBC Library’s Rare Books and Special Collections offers weekly drop-in tours every Wednesday, for students, faculty, and the general public to come in and see the collections in person. UBC Library’s recent acquisition of The Vancouver Weekly Herald and North Pacific News was featured in Montecristo Magazine. UBC Library's recent acquisition of The Vancouver Weekly Herald and North Pacific News was featured on CBC radio. The interview begins at the 2 hour 50 sec mark. UBC Library's recent acquisition of The Vancouver Weekly Herald and North Pacific News was featured in the Library Journal's InfoDocket.